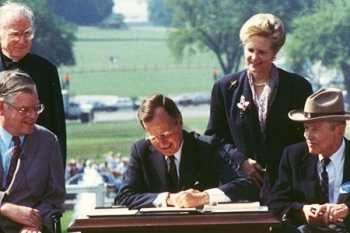 Justin Dart, considered the father of the Americans with Disabilities Act (ADA), is seen here wearing his trademark hat as he watches the first President Bush sign the bill he worked tirelessly to pass. But Justin Dart understood that those of us who need our government to serve us well must first exercise the responsibility of voting. Yet, US voters continue to vote at appallingly low rates, especially in mid-term elections. 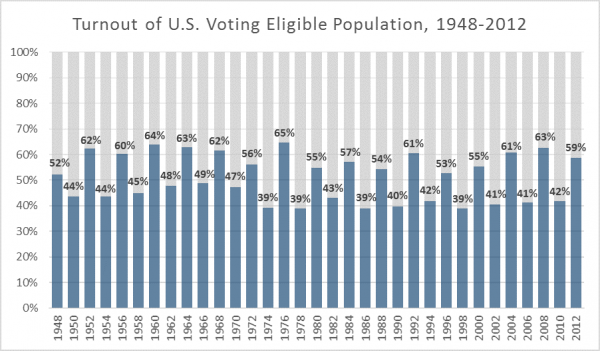 As shown in this chart put together by FairVote.org, mid-term election voting rates are typically mired in the low 40%, never exceeding 50% since WW II. Even Presidential elections only increase voter participation to the high 50% to low 60% rates. There are probably many reasons for this, including a feeling of helplessness, cynicism wrought by incessant negative ads, voter suppression laws, and perhaps worst of all–too many Americans simply take their right to vote for granted despite the very real implications of how those who govern us, by receiving our votes, impact our day to day lives and long term futures. In most other democracies, people take their right to vote far more seriously than Americans. A recent article lists 58 countries with a better voter turnout rate than the United States, led by Uruguay at 96%. A few years ago, I was hiking in the remote Copper Canyon in Mexico, home to the indigenous Taramuhara people, who fled to these remote mountains to escape Cortez & his murdering and enslaving Spanish troops. Due to their remoteness, many Taramuhara walk the mountains barefoot and live a simple, subsistence life. Many do not speak Spanish. They are famed for their long-distance running ability. During my hike, one Sunday, I noted far more Taramuhara than usual walking out of the mountains towards the local village. I asked a local if he knew why so many were walking barefoot out of the mountain. He informed me that there were municipal elections being held and they were going to vote. I was stunned as I am sadly confident that there probably isn’t a single American who would walk barefoot out of the mountains to vote in a local election. But we can and must change that. As election day approaches, let’s remember Justin Dart’s words. Vote as if your life depended on it…because it does. As I have done for the past 2 years, I will serve as a local election official. I look forward to seeing very long lines of neighbors exercising their right to vote.